Proper request, proper response. This exchange between boys and girls lined up in Andrew Hill High's cafeteria is required before they are allowed to pair up, link hands and position their feet for ballroom dance lessons their instructor says could change their lives -- even if they don't realize it just yet. ``We instill more than dance -- the kids learn to be respectful of each other,'' declares Adrian Flores, a champion ballroom dancer who has made a career of teaching his art. The self-assurance and sensitivity to others gained through ballroom dancing can only help students land a solid career foothold in an increasingly global society, Flores says. So since late January, about 80 students of all grades and various ethnicities have been learning the fox trot and other dances during hourlong sessions two or more times a week. Bringing ballroom to the barrio is a typically adventurous move for Andrew Hill, a San Jose campus of 2,100 students renowned for instructional innovations that have raised test scores and brightened future prospects for its students, most of whom are from working-class families. Since the pilot program's debut, the interaction has sparked new friendships that might otherwise not have happened, participants say -- not to mention lots of curiosity among classmates not enrolled in the class. ``Lots of guys ask, `What do you do in there?' '' said sophomore Jeffrey Church, 15, with a laugh. The idea is to offer students the chance to gain self-assurance in any social situation. Much of this comes through dance. Also included are etiquette lessons by Syndi Seib, whose San Francisco-based company provides such training to business executives as well as special programs for young people. 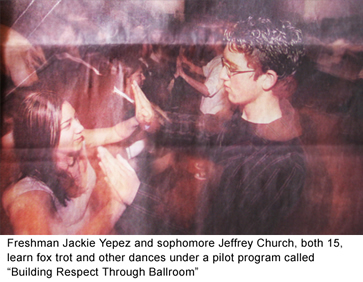 Ballroom dancing has been blazing its way into schools across the country in various forms for years, inspired by educators convinced of its transformative powers. Fueling recent interest are popular TV shows such as ABC's ``Dancing with the Stars'' and TLC's ``Ballroom Bootcamp,'' which vividly portray the intense physical and mental demands of the art, as well as the personal satisfaction derived by dancers who give it their all. And then there's the ``Mad Hot Ballroom'' effect. The critically acclaimed 2005 documentary follows several groups of fifth-graders from New York City schools through their emotional and eventful preparation for a citywide dance competition. 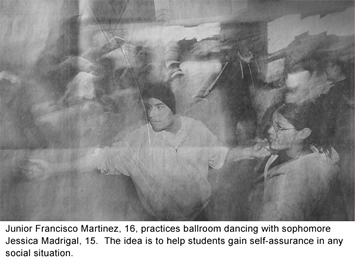 The students received instruction through the American Ballroom Theater's non-profit Dancing Classrooms, which has been around for a decade and now enrolls 8,000 fourth- and fifth-graders in 68 New York City schools. Throughout the film, teachers remark about the positive changes they see in their dancers, especially those who had been struggling with behavior problems. Andrew Hill students who attended the first few classes displaying full-body-armor-attitude now arrive open and eager to learn new routines, says teacher Tere Barbella, who introduced dance impresario Flores to the school after meeting him at an educational seminar. Flores says he intends to develop ballroom dance classes at K-12 schools throughout the area through his San Jose-based production company. Although students are just a few weeks into their program, Barbella said they are coming to class better prepared and ready to focus. Students are less self-conscious despite the gawkers who sometimes gather at the cafeteria doors, and there's not much awkward toe-mashing to be seen. Students were drilled in short dance sequences, with Flores walking rapidly up and down the lines of dancers to correct hand and foot placement. Freshman Donny Rivera, 15, focused intently on his partner during an intensive lesson in the fox trot. He would have a few different partners during the hour, since girls outnumber boys 2-1 and partners are encouraged to switch. Donny used momentary breaks to practice steps on his own and to coach fellow dancers as they launched their tentative spins and turns. As classes have progressed, Barbella has noticed more students pitching in like that. Later, she and Flores demonstrated how the dance should look altogether. Their routine was seamless, all flowing arms and graceful turns. The students whooped and applauded, then turned back to each other with renewed energy to try it themselves. Although the course is not even half over, students are already asking whether it will be offered next year, Barbella said. There's a good chance it will be, she said, and there's considerable interest in starting a ballroom dance club, too. Overall, ``This has been a great opportunity for us,'' said sophomore Nina Torres, 15. Both Flores and Seib are donating their services for the pilot program. Tony Soprano's Pizzeria in San Jose is offering a free meal to the class in the near future. Seib will use the occasion to impart table manners tips. Merely walking away just won't do. Contact Luis Zaragoza at lzaragoza@mercurynews.com or (408) 920-5803.